This could very easily be a long article. Think of all those unwanted Christmas presents of random kitchen equipment lurking at the back of your cupboards. 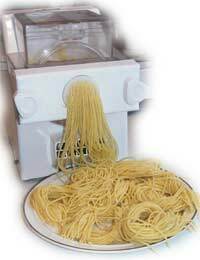 Think of all the fads you had that needed a piece of kit - fresh pasta phase ring any bells? If you happen to be able to look into the kitchen cupboards of a Chinese housewife, you will find that they rarely have an oven, let alone a juicer, and they still manage to create the most delicious meals night after night. You really don’t need a whole host of kitchen equipment filling up your cupboards. A good set of knives, chopping boards, a large mixing bowl, some wooden spoons and baking trays and you’re good to go. So who are the worst culprits when it comes to kitchen gadgets that stay in the box? Put on your best Alan ‘Fluff’ Freeman voice and let’s count down from four to one. Jamie Oliver has a lot to answer for (and not just for the Flavour Shaker – that beats them all). Getting everyone thinking they can be an Italian nonna, making their own pasta in minutes. The truth is, pasta machines are a real hassle; the dough is either too dry or too sticky, the shop assistant thinks you are the most high maintenance person ever when you say that you must have ‘OO’ flour and you realise that dried pasta is not only really good, but available in bags that sit quite happily in your cupboard until you want it. Some people swear by their bread maker. They say they can make a dried cranberry, mixed seed and pine nut loaf for the cost of just looking in the Pret a Manger window. What is actually far more likely is that you use it once, having bought loads of yeast and flour (not to mention the teaspoon of dried milk – why is that?) and then shove it back into the cupboard without even washing that stupid paddle thing that makes the bread a funny shape. The ubiquitous juicer is found in eight out of ten homes, probably. And in 100 % of cases it is sitting sadly in its box, barely having been called into action for one use. The main reason is that it is such a hassle to clean it. For one measly thimbleful of carrot and apple juice you have to peel, core and chop about a kilo of apples and a field of carrots. Tune in next week for the kitchen equipment reject charts – a sorry list of pointless gadgets.